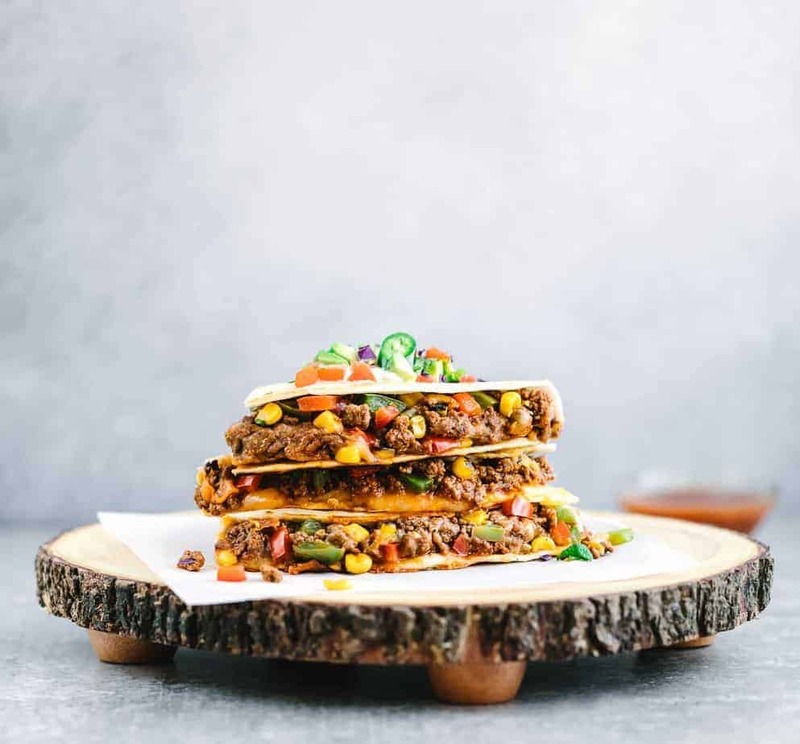 This cheesy ground beef quesadilla with chipotle seasoning is a quick Mexican-inspired game-day food or the perfect late-night snack. It’s served with mixed bell peppers and corn, also Mexican cheese on tortilla. Looking for last minute game day food recipes? You’re in luck. I am going to show you how to make an easy ground beef quesadilla with few ingredients. The homemade quesadilla seasoning from ingredients that you could easily find in your pantry. I chose ground beef as a quesadilla filling over steak because it’s inexpensive and cooks up fast. The left over meat (browned, un-seasoned) can be used in many recipes such as chili, pasta, lasagna, hamburgers, meatloaf, etc. This would make a perfect game-day food on a budget. Mexican party food can be prepared in so many ways, whether traditional Mexican food or a Mexican inspired dish like this one or this delicious Shrimp Ceviche With Avocado. The well-seasoned ground beef would also be great for casserole, burrito bowl, tostadas or tacos. 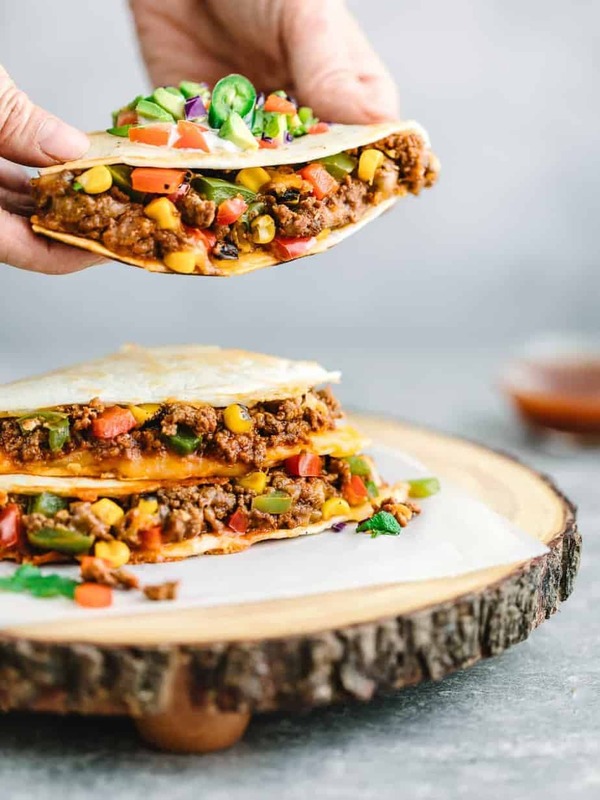 If you decide to make ground beef quesadilla casserole, simply place 1/2 portion of browned and seasoned ground beef on a 13 inch baking tray, top with 3 flour tortilla, repeat the process once then finish up with some cheese of your choice (such as Mexican Cheese or Cheddar Cheese). Let’s talk about the ground beef quesadilla ingredients. I used browned ground beef and seasoned it with homemade chipotle seasoning, a mix of bell peppers and corn, mixed Mexican cheese, all atop a 10-inch soft flour tortila. To make the homemade quesadilla seasoning, I used a canned Chipotle sauce in medium heat, cumin, tomato sauce, garlic, onion powder, dried oregano, ancho chili powder and olive oil. I added about 4 tablespoons of chipotle sauce to the 1.5 pound of ground beef. Surprisingly, both of my kids didn’t even notice the heat on those quesadillas. 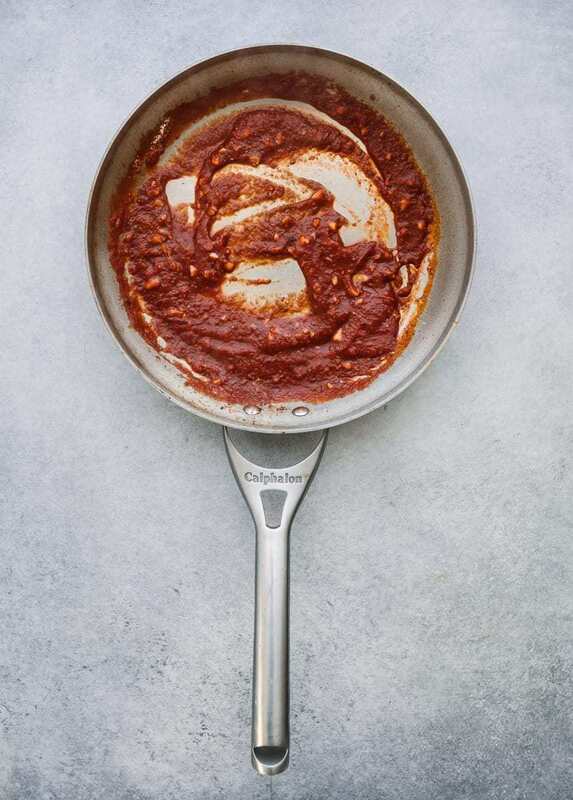 I would highly recommend this chipotle sauce over chipotle pepper in canned because you have more control to adjust the spiciness during cooking. If Chipotle pepper in adobo sauce is the only option you have, you can use about 1-2 peppers for this recipe. 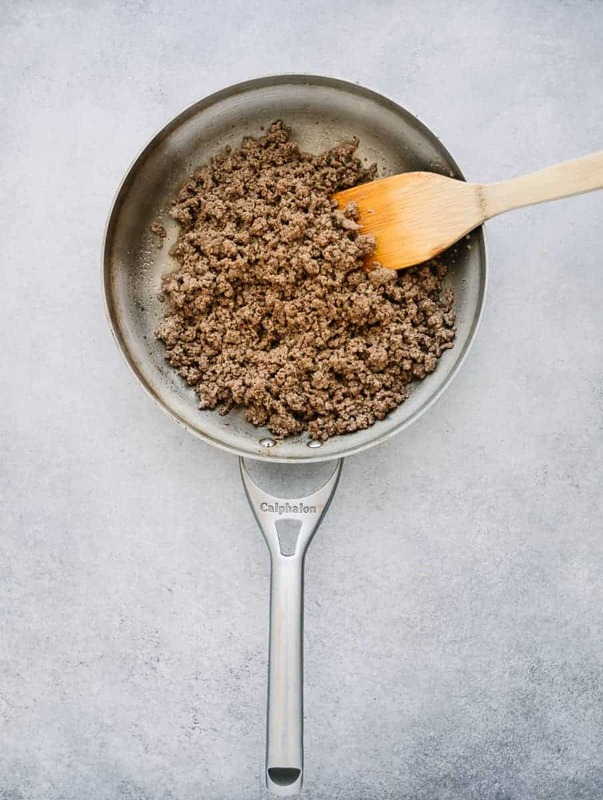 To brown the ground beef for a crispier and juicier protein, add the meat to a lightly oiled skillet pan and leave it for about 2 minutes before break it up. That way the meat will have enough time to gain some texture. You will also need to season the ground beef with salt and pepper. Once the ground beef is fully browned, it’s time to remove the juice and grease. You can do this by carefully tilting the pan so you can remove the liquid (then use a paper towel to absorb the remaining fat). Ground Beef Quesadilla with homemade chipotle seasoning. The seasoned ground meat would also be perfect for burritos, tostadas or tacos. In a large skillet pan, heat one tablespoon oil over medium heat. When the oil is hot, add the ground beef and let the meat sits in the skillet for about 1-2 minutes before breaking it up with spatula. Season with salt and pepper. Keep stirring the ground meat and cooking for about 10-12 minutes or until the meat is brown inside and no longer red or pink. The USDA sets the minimum safe temperature for ground beef at 160 degrees Fahrenheit. Important note: Be sure to remove the juice and grease. You can do this by carefully tilting the pan so you can remove the liquid (then use a paper towel to absorb the remaining fat). In a large skillet pan, heat two tablespoons oil over medium heat, add garlic and cook until fragrant. Then add tomato sauce, onion powder, cumin, dried oregano, chipotle sauce medium, and ancho chili powder. Cook for about 1 minute, then add ground beef. Keep stirring until the meat is well-coated. Season with salt and pepper according to your taste. Remove from the heat and set aside. 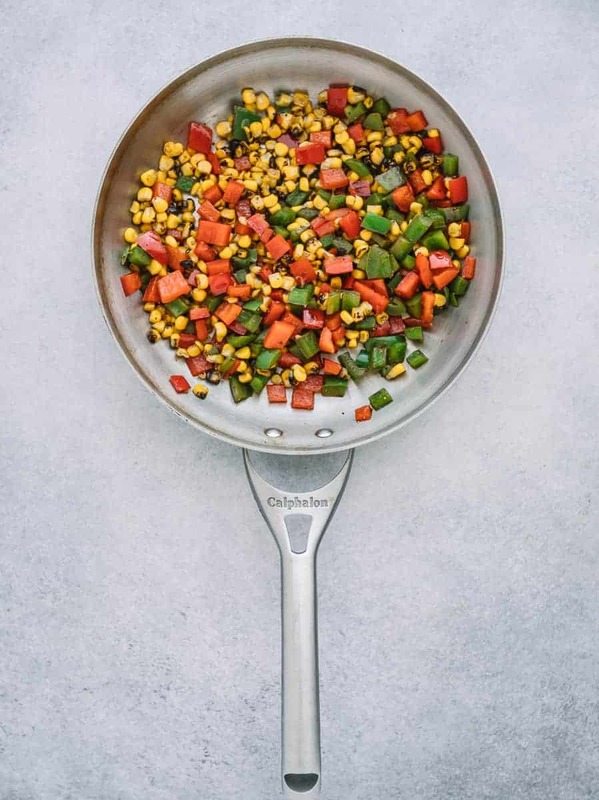 In a skillet, heat one tablespoon of olive oil over medium-high heat and cook the red bell pepper and green bell pepper for about 3-4 minutes. Add roasted corn and cook for 1-2 minutes. Season with salt/pepper. Remove from the heat and set aside. Add one piece of tortilla on a lightly buttered skillet and layer with a generous amount of cheese on the bottom of the tortilla. Add seasoned ground beef, mixed bell peppers and corn. Finish up with some cheese and top with a second tortilla. Cook the tortilla until it is golden on the other side and repeat this process on the second side until both sides of tortilla are crips and golden and the cheese inside is melted. Serve with fresh avocado or guac and jalapeno. These turned out terrific looking. My oldest son loves quesadillas. I have made them for him and they didn’t look anywhere near as good as yours look. We have tried doing something similar at home and it was lovely. This recipe is absolutely a must try because it is not only easy to make but healthy too! This sounds like a wonderful meal. I think these would be a nice change of pace on Taco Tuesdays in our house. I must try these out for dinner soon! I usually just make cheese quesadillas, but I think I’d enjoy this one too. There’s so many goodies in this. That looks absolutely amazing! I definitely need to try this. It has everything in it that I love to eat. This looks amazing and I love the flavors in this recipe. It’s definitely a recipe that we’ll enjoy and I’d love to make it for me and my husband. Oh yum yum. I love this flavor profile. I think this is my favorite kind of food. There’s something so homey and rich about it! Ground Beef Quesadillas with Chipotle Seasoning? SOLD! I LOVE quesadillas so I can’t way to try this recipe out. There’s something about homemade quesadillas that I just love. Oh wow, I need to make this! We love making quesadillas in our house but for some reason I never think to put in ground beef. I will be making these for sure! These are loaded with yumminess! We love making quesadillas at home, and I love all the flavors you’ve added to yours. FUNNY I only go to super bowl parties for the food! They had nachos at the party I went to but would have loved this! Oh my goodness how delicious do these look! Just packed with some delicious ingredients and I bet they taste even better than they look! This looks super tasty. I love any kind of Mexican inspired food, so this would be right up my alley. I’m not eating meat anymore, but these look so good! We are huge fans of Mexicans. That looks amazing! I really need to try it with beef. I’ve done them with chicken, but I think after seeing and reading this, beef is better! Oh I love how colourful it was prepared. I guess this is a great menu to add for Valentines day. Thanks for this, I will just add a valentines related design to add more colors and art to it. This looks very tasty! I will make me a meatless option for sure! The seasoning especially looks so great and colourful. Will use it for a vegetarian variant and it should be great.